1860, Zelkova “dragon wood”, iron fittings, found on Kangwha Island. Certified. This document chest is made from zelkova but because certain deep grains on this chest resemble image of a dragon, it is given a special name “dragon wood ” by the Korean and Japanese, and is the most valued by artisans of both countries. This chest was made for a scholar or high official, an elite class of people in by-gone days. No one could be in high office without being highly literate at that period. 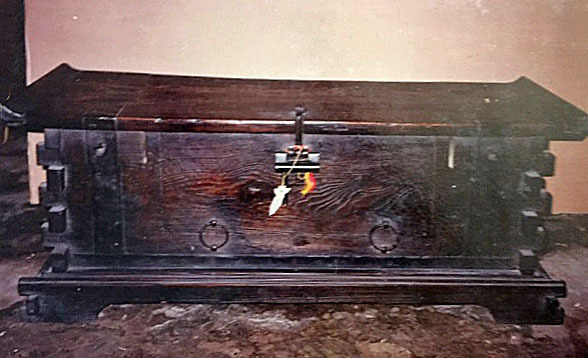 This chest was for him to store his documents, writings and scrolls, items valuable to him. He must have been sent into exile and allowed to take any valuable personal belongings with him. This chest is interestingly constructed in an alternating exposed-tenon post style and decorated with bands of metalwork. A small drawer comes out at each end in front under the top panel to store small personal items. A door panel opens down on hooped hinged to reveal storage space for documents, scholarly writings and scrolls. The deep grain on the top would not make a good writing table for the scholar, but the low chest would make a nice table for supporting his antique vases, religious or ancestral figures, and special manuscripts. The dark lacquer preserved the wood and makes it look rich. This is a rare piece and is certified by an appraiser approved by the Korean government in the 1900s.